Vertical Wall Fishing Pole Rod Rack 12 Natural TVWRR-12. The Vertical Wall Rod Rack is a convenient way to store your rods and reels off the floor, preventing them from being damaged. It mounts to the wall in minutes with the two included screws. The Vertical Rod Rack is great for anglers that have tall ceilings and can’t use The Ceiling Rod Loft. 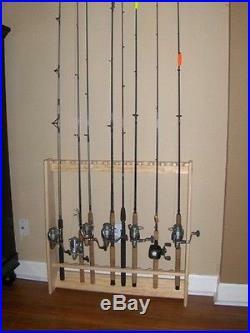 When you need even more room for your fishing rods, upgrade to The Vertical Wall Rod Rack-12 to the 18. Made from select grade solid lumber (not plywood, MDF or particle board) Remarkable finish. 2 1/2 on center spacing between slots provides more room for reels than other rod racks. Easy assembly with furniture grade hardware. Wall mounting hardware included. Side panels beveled to accommodate base boards. Be sure to View My Other Items For Sale. For more great deals on many name brand and designer items. All items are visually inspected and open electronic items are powered on. Some of the return items may need cleaning or minor repairs which we will try to describe in the listing. I will try to answer as soon as possible. Track Page Views With. Auctiva’s FREE Counter. The item “Vertical Wall Fishing Pole Rod Rack Holder Natural Pine 12 Rods TVWRR-12″ is in sale since Saturday, May 31, 2014. This item is in the category “Sporting Goods\Fishing\Fishing Equipment\Rod Rests & Holders”. The seller is “mike64220″ and is located in Land O’ Lakes, Florida. This item can be shipped to United States, Canada, United Kingdom, Denmark, Romania, Slovakia, Bulgaria, Czech republic, Finland, Hungary, Latvia, Lithuania, Malta, Estonia, Australia, Greece, Portugal, Cyprus, Slovenia, Japan, China, Sweden, South Korea, Indonesia, Taiwan, South africa, Thailand, Belgium, France, Hong Kong, Ireland, Netherlands, Poland, Spain, Italy, Germany, Austria, Israel, Mexico, New Zealand, Philippines, Singapore, Switzerland, Norway, Saudi arabia, Ukraine, United arab emirates, Qatar, Kuwait, Bahrain, Croatia, Malaysia, Brazil, Chile, Colombia, Costa rica, Dominican republic, Panama, Trinidad and tobago, Guatemala, El salvador, Honduras, Jamaica, Antigua and barbuda, Aruba, Belize, Dominica, Grenada, Saint kitts and nevis, Saint lucia, Montserrat, Turks and caicos islands, Barbados, Bangladesh, Bermuda, Brunei darussalam, Bolivia, Ecuador, Egypt, French guiana, Guernsey, Gibraltar, Guadeloupe, Iceland, Jersey, Jordan, Cambodia, Cayman islands, Liechtenstein, Sri lanka, Luxembourg, Monaco, Macao, Martinique, Maldives, Nicaragua, Oman, Peru, Pakistan, Paraguay, Reunion.